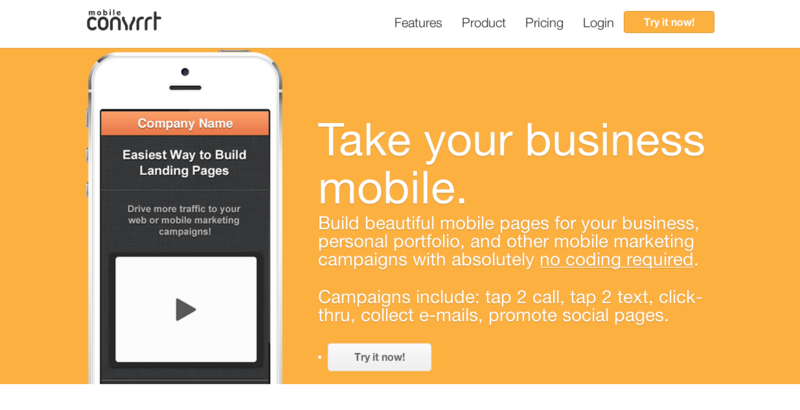 Landing pages can be extremely useful in any App Marketing strategy. Indeed, if well designed and carefully crafted, they can help increase conversion rate drastically. It is also a good way to raise app’s awareness and popularity. Having a strong online presence is unavoidable to achieve success. In this blog post you will see how you can benefit from having a landing page and we’ll give you 4 tools to help you create one. In a previous post, we mentioned how important it was to create a unique website for each of your app. Indeed, this allows you to have a strong basis that will provide valuable content on your app. Your prospects will therefore have a powerful referral on which they will be able to rely in order to get further information about you and your app. It’s also a very good way to build your app’s identity and universe. Since you do not have any length or design restrictions (unlike on your Apple App or Google Play app page), you are totally free to customize your website the way you want it. You can therefore be as creative as you want and integrate multiple call-to-actions. We also mentioned the importance of creating a blog as well as working on your social media presence. The whole point was to feed your audience with content and to spread your app very easily and with no budget. At the same time, these efforts will improve your SEO (Search Engine Optimization) and hopefully increase your rankings in the biggest search engines. This will therefore increase awareness, as you will attract organic users. Landing pages are actually another very interesting way of using the online space. They are proven to be very effective way of engaging users. It can be a good complement to your blog and/or website but it can also replace them if you feel that it’s enough. Landing pages can indeed contain a lot of information, call-to-actions, pictures, videos or download link… everything condensed on one single page. Purchase a custom domain name. Use bullet points to list your app’s best features. This will directly let your visitors know if your app will interest them or not. Plus, long texts are tiresome. Be clear and straight to the point. Use large and short headlines. Use screenshots to show off your best features, even if you already have a video. Visual matters a lot, people want to SEE your app. Use links to your social media pages or to your website. Insert a link to download your app directly thanks to deep linking. Don’t hesitate to use multiple call-to-actions all over your page. Make your them visible and easily accessible. Use good-looking buttons. Use badges to promote your app with official branding (download for free here: Apple badges / Google Play badges). Include an easy access to your customer support. Mention your other apps if you have some. Include awards or interesting testimonials if you can. Focus on the most important features…don’t overload your landing page with too much content: if you have a lot to say, use a dedicated website. Finally, and most importantly, use an awesome & high-quality design. 3 options here: create the page yourself (demands skills), use a pre-made theme like ThemeForest or ask help from mobile landing page builders. Although it might not be the cheapest way to go, we recommend using a third-party service to create your landing page. You will gain a lot of time and be guaranteed to get a high-quality page. You will also have more liberty to customize your page the way you want rather than if you used a premade theme. 1) Unbounce is a landing page platform allowing you to build, publish & A/B test landing pages very easily and without any coding knowledge required. 30 days trial available; plans starting at $49/mo for 5,000 unique visitors per month. 2) LaunchRock helps you collect interest and build an audience before you launch. This platform is very complete and offers various services including: branding & design, crowdfunding strategy, video production, website design & development, mobile app design & dev, advertising & user acquisition. It is (for the moment?) entirely free. **3) Landr **is an easy-to-use online tool that creates simply effective mobile landing pages and websites, in minutes. One single plan: $9/mo (billed annually) or $12/mo (billed monthly) for hosting. Create for free. **4) Convrrt **is another platform allowing you to build mobile landing pages very easily (no HTML knowledge required). Web landing pages coming soon. Plans starting at $9 for 2 hosted mobile pages. We hope that this article made you want to create your app landing page. It is a very powerful way of increasing conversion; so don’t miss this great opportunity. If you can use A/B testing before deciding which one you’ll spread all over the web. Of course, don’t hesitate to use any way you can to drive traffic to your landing page. Use social media, groups, forums and why not some paid sources like Google Adwords, Facebook Ads or in-app ads. What about your experience? Did you create a landing page? If so, what option did you use? Do you know other services? Let us know in the comments below, thanks!